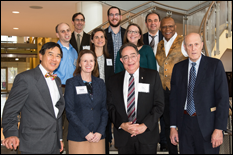 The 2017 UMB-UMCP Seed Grant recipients celebrate a year of research at the UMB-UMCP Seed Grant Symposium with (bottom row, from left) UMCP President Wallace Loh, Ph.D., JD; Vice President for Research for UMB/UMCP Laurie Locascio, Ph.D.; UMB President Jay A. Perman, MD; and UMB Executive Vice President, Provost, and Graduate School Dean Bruce Jarrell, MD, FACS. C. Daniel Mullins, Ph.D., works for the University of Maryland, Baltimore(UMB) and is a professor and department chair at the University of Maryland School of Pharmacy (UMSOP). Stephen Thomas, Ph.D., M.S., is a professor at the University of Maryland, College Park (UMCP) in the School of Public Health and the director of the Maryland Center for Health Equity. Despite the two working in different disciplines at institutions separated by 35 miles, they are united under a common interest: the barbershop. Utilizing each other’s strengths, Mullins and Thomas were able to connect, collaborate, and present their findings at the 11th Annual UMB-UMCP Joint Research and Innovation Seed Grant Symposium on Nov. 19 at the UMCP campus. The symposium was the culmination of the 2017-2018 UMB-UMCP Research and Innovation Partnership Grant Program, which provides startup funding for combined complementary research projects, selected from a number of joint research proposals. The goal of the program is to encourage faculty members from UMB and UMCP to use their respective disciplines to collaborate on new avenues of research that could not otherwise be explored by either university alone. “We had a barbershop colon cancer screening initiative in Prince George’s County and Washington, D.C., so when Daniel and I connected we thought about how back in the 1800s the origins of organized black barbershops came out of Baltimore,” explained Thomas. This coupled with the fact that one of Mullins’ mentors was the late Dr. Elijah Saunders, one of the pioneers of the barbershop initiatives in Baltimore, sealed the deal on their partnership. “It was the beginning of great a collaboration,” continued Thomas. Mullins and Thomas were one of four teams to receive funding from the UMB-UMCP Seed Grant Program in 2017. The teams included Bruce Yu, Ph.D., from the UMSOP paired with Taylor Woehl, Ph.D., from the A. James Clark School of Engineering; Kelly Doran, Ph.D., RN, from the University of Maryland School of Nursing paired with Jessica Magidson, Ph.D., from the University of Maryland College of Behavioral and Social Sciences; and Richard Pierson, MD, and Jonathan Bromberg, MD, Ph.D., from the University of Maryland School of Medicine (UMSOM) paired with Christopher Jewell, Ph.D., from the A. James Clark School of Engineering. During the symposium, each team presented its findings, answered questions, and discussed the next steps for its research. The topics of research ranged from engineering lymph nodes as a form of therapy for autoimmune diseases and transplant rejection to peer advocacy and intervention for low-income substance abusers. The program brought together professionals from across all disciplines who may have never had the opportunity to collaborate otherwise. Laurie Locascio, Ph.D., who recently was appointed vice president for research at the University of Maryland — overseeing research at UMB and UMCP — sees the potential in those connections and hopes that the seed grant program will continue to cultivate interdisciplinary collaboration, which will then produce innovative research and sustainable results. The success of the UMB-UMCP Seed Grant Program also is apparent in the University of Maryland Strategic Partnership: MPowering the State, or just MPower, which funded the seed grant program. UMCP President Wallace Loh, Ph.D., JD, described the seed grant program as a “precursor” to MPower, which was created to help leverage the strengths and missions of the two universities to advance interdisciplinary research, create opportunities for students, and solve important problems for Maryland and the nation. Loh went on to say that without the UMB-UMCP Seed Grant Program, the strategic partnership between the two institutions may not have become as successful as it is today. This article was written by Jena Fricke, Senior Media Relations Specialist, University of Maryland, Baltimore.